Top Thrill Dragster is a steel, hydraulically-launched roller coaster located at Cedar Point Amusement Park in Sandusky, Ohio. It was the first "Strata Coaster," loosely defined as a complete circuit coaster that is 400 to 499 feet tall. Eejanaika, Japan - most inversions, perhaps loudest screams. This roller coaster not only whirls through the loops, but each cart additionally rotates 360 degrees, guaranteed to scramble even veteran coaster riders. Eejanaika is the fastest and longest, with the most inversions, 14 in total. 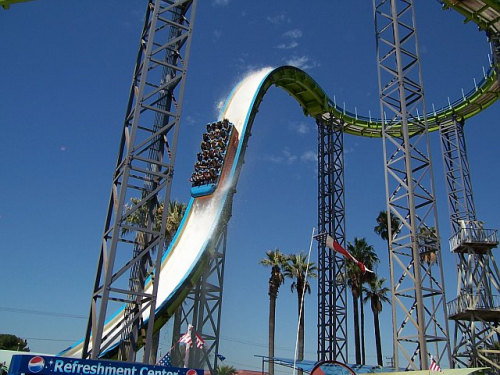 Bonus Image - Knott's Berry Farm World Record 115 foor water chute!